Why should I be worried about dying? It’s not going to happen in my lifetime! Thus logician, philosopher and puzzle-constructor Raymond Smullyan, who died last week at the age of 97. I started reading Smullyan when I was a teenager; I don’t remember whether I read This Book Needs No Title (about philosophy) or What Is The Name Of This Book? (puzzles) first, but whichever it was started a lifetime of enjoyment of both. His philosophy was decidedly playful. In one of his books he dispenses with the question “Does a dog have the Buddha-nature?” with Of course a dog has the Buddha-nature! You just have to look at some dogs to know that. His puzzles were deceptively simple and quickly ended up being disguised versions of some very difficult topics in first order logic, combinatory logic, Boolean logic, and so on. Though he was most famous for his “Island of Knights and Knaves” puzzles, where knights can only tell the truth an knaves can only lie, he produced a great many puzzles on other topics. To Mock A Mockingbird, in which combinators are thinly disguised as singing birds, is a particular favourite; it changed my understanding of the fundamentals of computer programming. Among my favourites of all his puzzles though were his two books of absolutely delightful retrograde chess puzzles. Most chess puzzles consider the future: from this position, what should white play next to ensure a mate? Retro puzzles are not concerned with the future, but rather the past; what had to happen in the game in order to arrive at this position? Leave your thoughts in the comments and I’ll give the answer later this week. Can the king be in check? Either king *can* be in check, but certainly *both* of them cannot be in check at the same time! If it’s B3, what was Black’s move to get there? Then white is in check, and therefore black just delivered that check. How? This stumped me to the point I was unable to think about anything else. Very nice puzzle. I believe C3 is the only answer, but I won’t spoil the “how” (which is the true puzzle). Quit reading if you want no hints. I will say that there is an seldom used capture that must lead up to this position – a capture that puts the capturing piece on a previously unoccupied square. Well played. I couldn’t get around the double exposure without the hint. I struggled for a long time with the fact that if the position of the white king leaves the black king in check, then white must have just completed a turn, and that creates a problem because clearly white could not have just moved the bishop (since anywhere they moved it from would already have had the black king in check) – so white must have just moved the king. But we’re told we’re looking for the unique position where the white king could have been on the board, and if it just moved, then we could have picked it off the board from either the square it moved from, or the square it moved to. Unfortunately the same logic also defeats the idea that the white king must be in a position that prevents the black king being in check, because our only option then is B3 – and that would mean that white is in check, so it must be white’s turn. And if it’s white’s turn and the king’s on B3, white can move it – to either C3 or A3. So if B3 is a valid answer, then again we haven’t found a unique position for the king. But I missed a branch in that logic, which is that there is a way to tell the difference between the board before and after the white king has moved *if the white king took another piece off the board when it did so*… and that proved to be the insight needed to figure out why it does indeed have to have been taken off C3, though there’s a little more fun to be had figuring out what piece it must have taken, and how it came to be there in the first place. Brilliant hint, just enough to get you thinking without giving it away. I presented this puzzle to a friend and while explaining how I got to the solution, I realized that there are two solutions! Couldn’t white’s last move be A3 instead of C3? Could Eric’s statement (“There is only one square where the white king can be such that the position is possible to produce in a legal game of chess.”) be wrong? Or am I missing something? 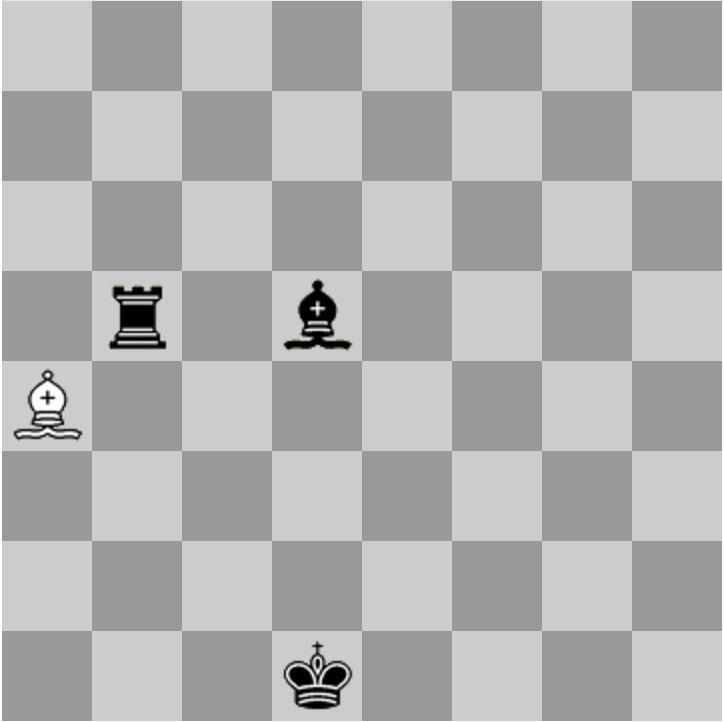 If white moved the king to A3 not C3 – presumably from B3 because otherwise black was already checked at the start of white’s move – you need to explain how black managed to place both the rook and the bishop to check the king on B3, knowing that at the start of black’s move, white can not have already been in check. It’s possible for black to have moved a piece from B4 to A3 on that turn, which would have revealed the rook check – but the bishop would already have been in its checking position, so that can’t be it. Maybe a knight from C4 moved to A3? No, because the rook would also already have had check. No, there’s no way for black to have brought about that double check and leave the board in this position if the king fled to A3. If white’s last move is to A3 from B3, then what was black’s move before that? It was either with the king, the bishop, the rook, or possibly a piece that was taken on A3. Whatever move it was, delivered a double-check to white. So what was the move? This is the solution I came up with. Last move can either be C3 or A3. Well… I feel silly. Obviously the black pawn is not on the final board. His book “Diagonalization and Self-Reference” formalized some of the concepts I first discovered in “Godel, Escher, Bach”. He had a fantastic ability to explain complex concepts in simple ways. Pingback: Why should I be worried about dying? Raymond Smullyan got me into logic and related as well. I still have the books from when I was a kid.